Jiang Zuyu (September 1924 - 1989) styled himself Shuhe. Since the 1950s, he has been a Chinese teacher in six primary schools in Dongcheng District of Beijing. He obtained the title of "senior teacher" in 1984. Since childhood, he has been taught by Wu Landi, Zhang Boying, Hua Shikui and other famous persons. 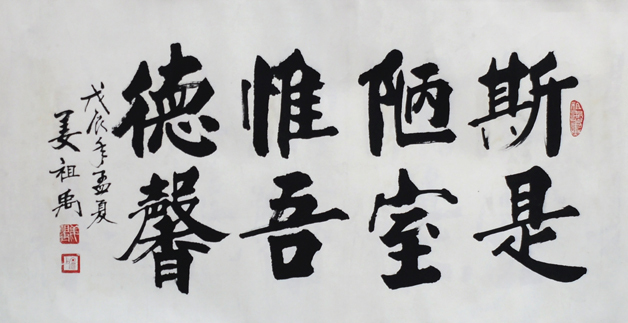 In the 1980s, he participated in many exhibitions organized by the Beijing Calligrapher Association and won awards. At the invitation of the Beijing Calligrapher Association and the Japanese Book Association, he held exhibitions at the Museum of Chinese Revolution (now the National Museum) and in Tokyo, Japan.